A simple, effective regimen for you to clean up and detoxify your body while giving a tune up to your metabolism. It is easy and inexpensive. Burn Clean for Well Being is a regimen for the proper care and maintenance of the vehicle that transports you through life – your body. Think of it as starting with a tune up followed by operating instructions. Since this is the 21st Century where speed and convenience are so greatly appreciated we are going to jump right to the instructions then explain the products and follow it up with an explanation of the conditions that are taking place inside you that warrant this all important exercise. The TOTAL OXYGEN CLEANSE consists of Colosan and Hepasan. 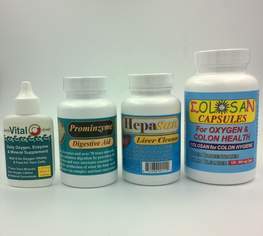 Colosan uses oxygen to cleanse your intestines and colon and Hepasan is a liver, kidney and gall bladder flush. This is how it’s done: Take six capsules of Colosan three times a day for seven days. It is important to take Colosan with ample water on an empty stomach and wait an hour before consuming anything else. On the third day start taking four capsules of Hepasan, three times a day around mealtime for the rest of the week. The Total Oxygen Cleanse is a thorough, gentle cleanse of the intestines, colon, liver, gall bladder and kidneys. It is so simple and convenient that everyone is doing it. It takes one week. What are you waiting for? Run Clean is a daily supplementation of liquid oxygen drops called Vital O and a digestive aid that uses friendly probiotic bacteria, minerals and enzymes, called Prominzyme. Vital O provides extra oxygen to boost metabolism and oxidize toxins. Prominzyme acts to turbocharge digestion for maximum nutrient extraction as you process your foods. This leads to an optimum combination of nutrient extraction and utilization that is accompanied by improved breakdown of toxins and elimination of waste. The result is a system that runs clean and efficiently. When you run clean - you get well being. If losing weight is part of your objective you can incorporate Thinner G for all natural weight loss into your Burn Clean regimen. Thinner G blocks the uptake of excess fats, carbohydrates and sugars while reducing cravings and causing your body to burn more calories at the cellular level. In addition to a healthy, gradual loss of weight, Thinner G lowers blood sugar, cholesterol, triglycerides as well as blood pressure. That’s it the Total Oxygen Cleanse and Run Clean are the two steps for you to Burn Clean for Well Being. The liver is the largest solid organ in the body. The liver is the body's blood filter. It traps, breaks down and eliminates bacteria, poisons and toxins. It is a factory. The liver manufactures enzymes, cholesterol and proteins, converts beta carotene into Vitamin A and produces bile for digestion. The liver converts fats into sugars and sugars into fats as needed by the body. It is a warehouse. The liver stores spare blood reserves, fat in the form of cholesterol and sugar based fuel reserves called glycogen. The liver processes a tremendous amount of blood. At any given moment it contains 13% of your blood and every blood cell in your body passes through it every three minutes. When the liver gets clogged with fats and toxins it cannot possibly filter efficiently and toxins build up in your system. 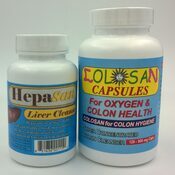 Hepasan is a liver, kidney and gall bladder flush. It burns off the stored carbohydrates and fats that are clogging the liver. Hepasan also stimulates the liver to break down toxins and dangerous chemicals. Hepasan increases blood flow by enlarging the capillaries while thinning the blood, interstitial fluids and accumulated mucus to gently flush the liver and facilitate toxin elimination. It thins the bile. Excess bile is stored in the gall bladder and is the basis of stones. It should be flushed regularly to keep you running clean. You get a Colosan Capsule and a Hepasan for the Total Oxygen Cleanse so you can clean your colon and intestines while you flush your liver, kidneys and gall bladder. Then jump into action with the Action Special of Prominzyme for optimum digestion and Vital O to detoxify and energize your body. Slim down with Thinner G it's "Synergy for a Thinner Me". You also get a copy of the informative CD Four Steps to a Leaner Healthier You and the White Paper - Healthy Weight Loss! A $175.00 Value! An enzyme is a protein that catalyzes, or speeds up a chemical reaction. Enzymes are essential to sustain life because most chemical reactions in the body would occur too slowly or would lead to different byproducts without the assistance of enzymes. Digestive enzymes are responsible for breaking down our foods rapidly during their brief transit time from the beginning to the end of the digestive tract. There are specific enzymes tasked for each component of the foods we consume. There is one for proteins, fats, dairy, carbohydrates and fiber. Supplementation of enzymes makes for more complete and effective digestion. Most enzymes require minerals as a catalyst to stimulate their activity. Probiotics are friendly bacteria. There are 400-500 different species of bacteria inhabiting the human intestinal tract. Their number can exceed 10 trillion. That’s more cells than are in the human body. These friendly flora manufacture vitamins B1, B2, B3, B5, B12, A, D and K as well as essential fatty acids. They break down milk and protein, produce natural antibiotics and antifungals to prevent harmful growth, destroy molds, viruses and parasites. They increase immune cells, balance pH, break down and rebuild hormones and neutralize pollutants and pesticides. Prominzyme is a combination of Probiotics, Minerals and Enzymes that maximizes the conversion of what we eat into what our body needs to function while facilitating the elimination of fully digested material waste. Prominzyme provides more horsepower and less exhaust what a way to burn clean. Vital O provides liquid oxygen supplementation. It is a type of product known as stabilized oxygen. These are drops that are put into your drinking water that release oxygen directly into your bloodstream through the rich capillary network of your stomach. It is important to point out that there are two types of oxygen that your body uses. Your red blood cells deliver oxygen in the form of O2 to your body to power your metabolism in a process called oxygenation. Your white blood cells deliver oxygen singlets or O1 to your body to kill germs, break down toxins and eliminate unhealthy cells in a process called oxidation. Both O2 that the red blood cells use for oxygenation and O1 that the white blood cells use for oxidation are necessary for maintaining a clean and efficient bloodstream. Vital O is a liquid oxygen supplement that delivers both types of oxygen to your body in abundance. This dual action stabilized oxygen supplement also contains the minerals, enzymes and amino acids required to facilitate and enhance the delivery of oxygen. Vital O is indispensable if you want to burn clean. ...Burn Clean for Well Being. Burn Clean for Well Being is a regimen that has evolved over the past fifteen years as a gateway to healthy living. Maintaining your health and vitality is a personal responsibility and this is a simple and effective way to accomplish your goal. Family Health is an All Natural Apothecary where you can find the most important nutritionals and most effective remedies for a majority of common ailments. At Family Health News we offer some of the most unique products in the “natural health” and “alternative medicine” worlds as well as in-depth, informative articles on a broad range of complementary and holistic medicine topics. Family Health News has been on the forefront of Oxygen Therapy, Oxygen Supplements and Oxygen Products for over 25 years. "I would absolutely recommend the Burn Clean regimen. I say this and I do not say it lightly, I think they are the best"
"Such a great service is rare to find! Burn Clean has really exceeded my expectations. Thank you!"